I did survive the holidays. Sometimes I wish I had an "OFF" switch. This photo says it all. I don't knit holiday presents for friends who live in two so every year I make cookies for my neighbors, friends, co-workers, etc. who live locally. This year I made 20 different types. Overkill? Yes. The problem is that I have cookies that I like to make every year and every year I add to the list. 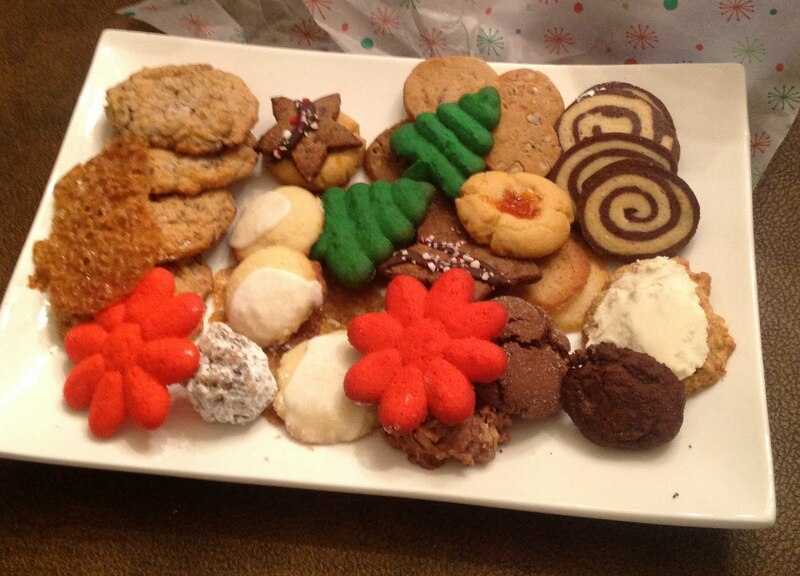 It takes a surprisingly long time to bake 20 different types of cookies. AND I did finish up my holiday knitting and everyone got their presents BEFORE Christmas for a change (expect for the one package I addressed incorrectly). Now I can relax. I didn't receive many lessons to review during the holidays and those that I did get took forever to get to me. Since the first of the year I've received lots of new orders. I suspect New Years Resolutions are the reason. My New Year Resolution is the same as last year...try to use stash yarn. This week's tip is about measuring. 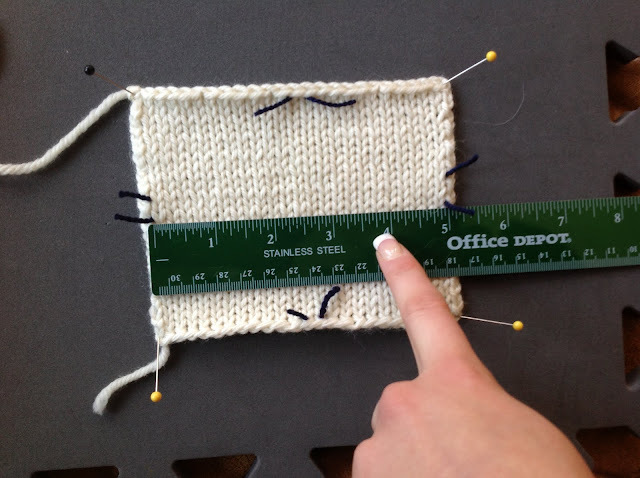 Many knitters are confused about how to measure their work. You use different procedures for measuring your work for gauge and to measure a project in progress. Measuring the length of the swatch to determine the row gauge is a bit more tricky. You want to measure only rows that are full size rows. 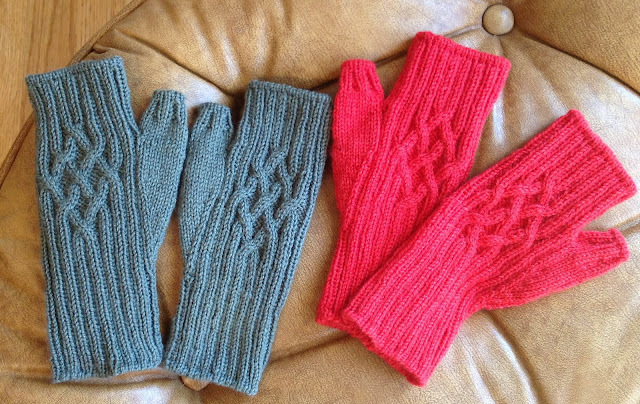 Don't include the cast on row or the bind off row. They aren't the same size as regular rows. 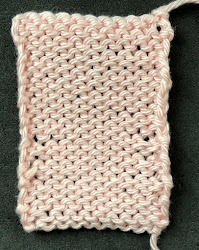 The rows in some stitch patterns are easier to see (like garter stitch). 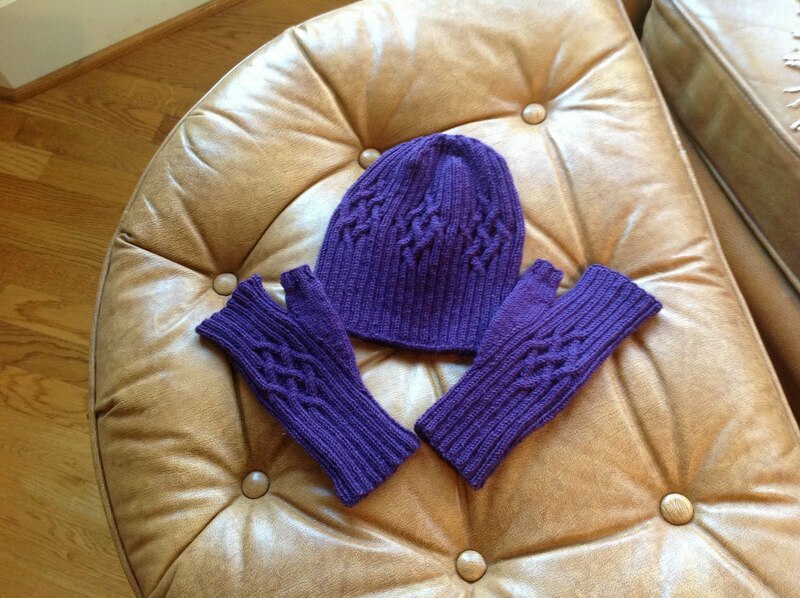 The photo shows stockinette stitch. LengthThe other time you have to measure your work is for length. For example, many patterns will says something like this "Work in pat as est until piece measures..." When you are measuring for length, DO NOT include the stitches on the needle. Measure from the bottom of the piece (or armhole or whatever the pattern indicates) right up to the stitches on the needle. 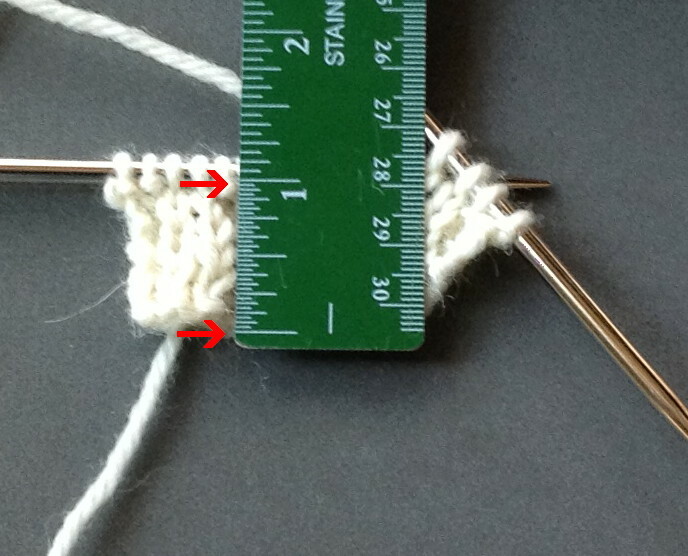 If you include the stitches on the needle in your measurement, the measurement will be short. For most projects and weights of yarn, this isn't that big of a deal but if you are working with a bulky yarn, it can be significant. Think what happen to the stitches on the needle when you bind off. When they are worked they lay at the top of the piece and don't contribute to the length of the piece. This comes up in the Masters Program frequently as knitters are expected to measure very exactly to demonstrate they know how. (Whether they do this in their own projects is up to them.) 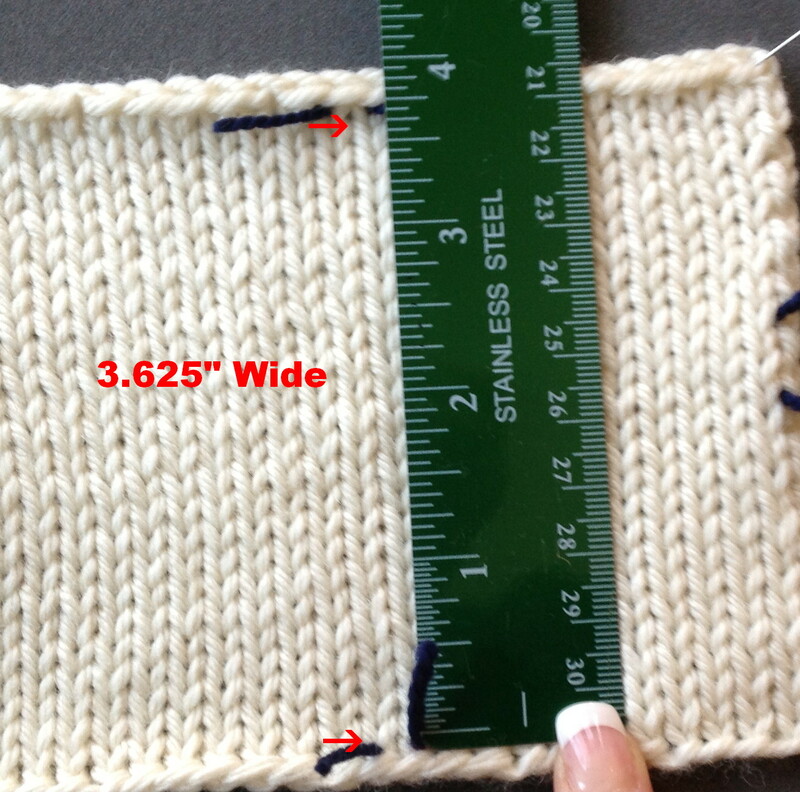 When the instructions state to work in ribbing for 2", the ribbing should be very close to 2". Of course, it will NEVER be perfect as stitches don't neatly conform to exact measurements. A tiny bit over or under is acceptable. 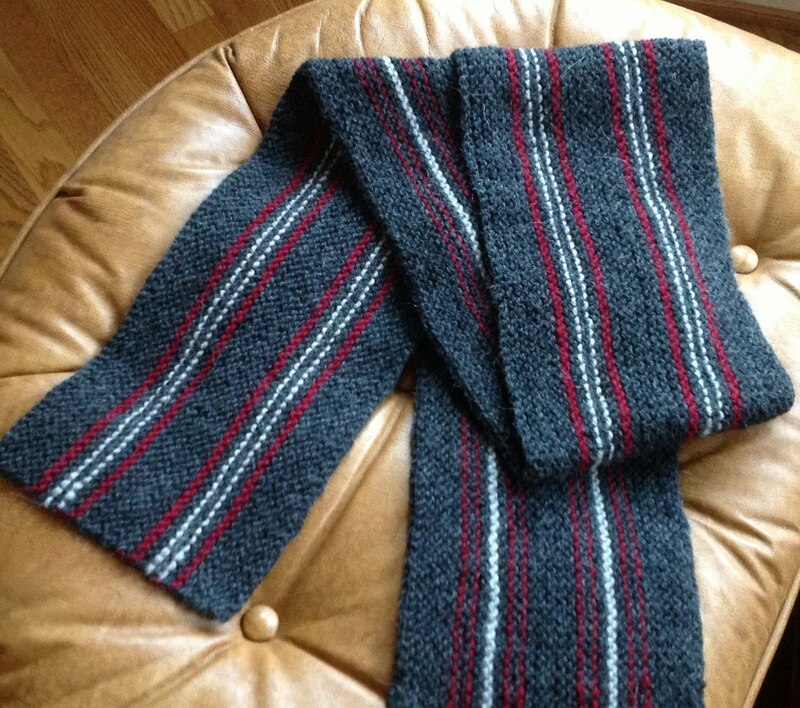 This photograph shows the measurement of ribbing. The link to the video is Measuring for Gauge and Length. I had a videographer this week but, alas, she goes back to school next week. It makes things much easier. I thought I could ask my neighbor if her teenage son could help out but the thought of saying, "I was wondering if your son could help me with some videos" creeps me out! Between the basketball schedule and the Met's HD schedule, it looks like salon will be on Sunday most of the time. This Saturday I will be at the theater for 5 1/2 hours to watch Berlioz's Les Troyens. 5 1/2 hours is a bit long but since I studied Classics I feel compelled to see it as Acts 1 and 2 cover the fall of Troy and Acts 3 and 4 are about Aeneas and Dido. Can't miss that! Anyway, Salon will be from 2-5pm on Sunday. 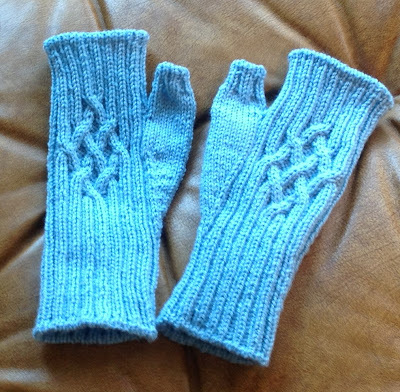 I used up quite a bit of stash yarn to make the fingerless mitts. I felt quite virtuous. 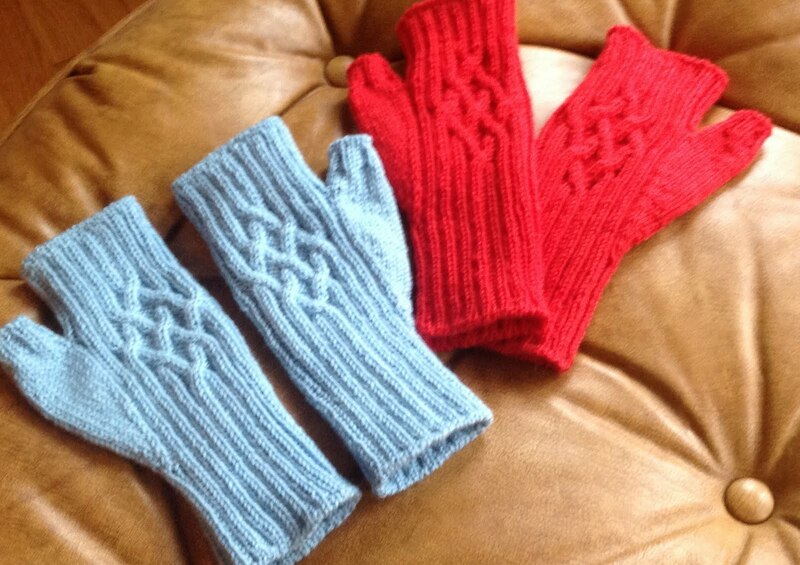 I did have to buy yarn for my daughters mitts and gloves (no photos...they whisked them away too fast). Here is the line up. I had the pattern memorized by the second pair. I wasn't able to use stash yarn for my nephew's gift. Alright, I could have but the yarn was Dale Baby Ull and it would have taken forever to knit the scarf so I used Berroco's Alpaca which was absolutely wonderful. I have enough to make me a hat or something. Now I have to work on things for Cast On. I am doing a linen dress for the Summer issue. The Fashion Framework is on Shrugs and I thought a nice neutral dress could be useful for the photo shoot. I was dreading the knitting thinking it would take forever. I started the back exactly a week ago and I finished it last night. It is soaking in a tube of water right now and I will block it as soon as I finish up this entry. 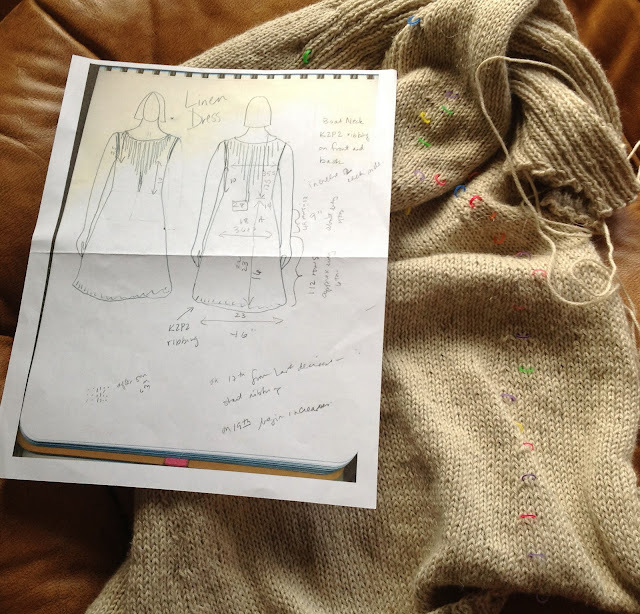 Here is a photo of my design sketch and measurements. Here is a plug....I calculated my gauge and figured out EVERYTHING before casting on. I didn't have to rip out a stitch. By the way, if you look closely you can see the dental elastics I used to mark every decrease and increase. That way, I can make sure the front matches the back!